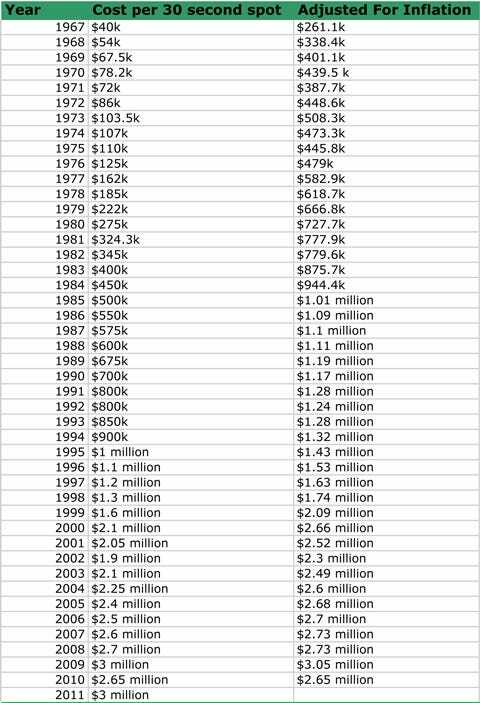 Earlier today we took a look at the rise of Super Bowl ticket prices through the years, and much like the cost of tickets, the cost of ads increased steadily until very recently when the NFL’s popularity exploded. The first time the average cost of a 30 second ad broke $1 million was in 1995, and since then prices have increased by about $100k a year. *Inflation prices calculated using the CPI Inflation Calculator from the Bureau of labour Statistics. **All costs are estimates (some years have conflicting data). ***Data compiled from AdAge, CBS News, and Media Buyer Planner.